Cinderella's slipper has captured the hearts and imaginations of generations of women around the world, and now it has come to life! 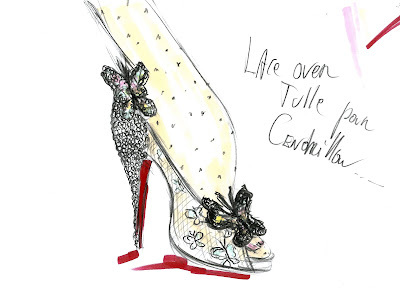 Walt Disney Studios and world-renowned shoe designer Christian Louboutin unveiled the ultimate, modern- day Cinderella inspired slipper in Paris, during Haute Couture week July 2-5. These gorgeous whimsical shoes truly embody the magic of Disney's timeless classic, Cinderella. “Cinderella is not only an iconic character when it comes to beauty, grace and fairytale love, but also shoes,” explains designer Christian Louboutin. For Louboutin, the worlds of fantasy and shoe-making collided in perfect harmony when he was invited by Disney to re-imagine Cinderella’s famous slipper in honor of Disney’s global release of the classic masterpiece “Cinderella” Diamond Edition on Blu-ray™ this Fall. Cinderella’s legendary slippers have been re-imagined with the mastery of one of this generation’s most important designers. Lightness, beauty and transparency are the words with which Louboutin describes this special pair; they are a dream materialized. The designer’s magic touch brings this iconic shoe to reality and gives it a modern twist. Delicate lace adorned with crystals gives these slippers an enchanting look. Two sparkling butterflies rest prettily on the shoes, one landing on the vamp while the other sits closely behind atop of the crystal covered heel, gently brushing the ankle. 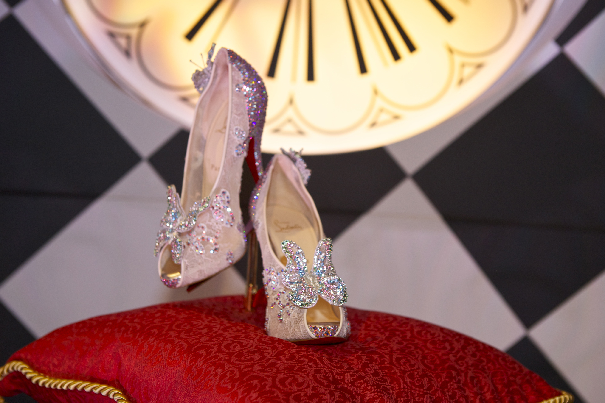 Louboutin’s signature red soles add the final dash of excitement as Cinderella’s slippers come alive. “Her character and her story dictated the design to me, it was all there in the pages and the words of this tale,” explained the designer. 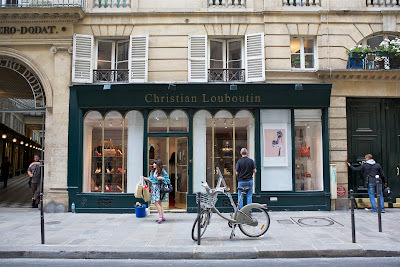 Christian Louboutin’s famous red soles are instantly recognizable for their elegance, innovative, playful designs and femininity. 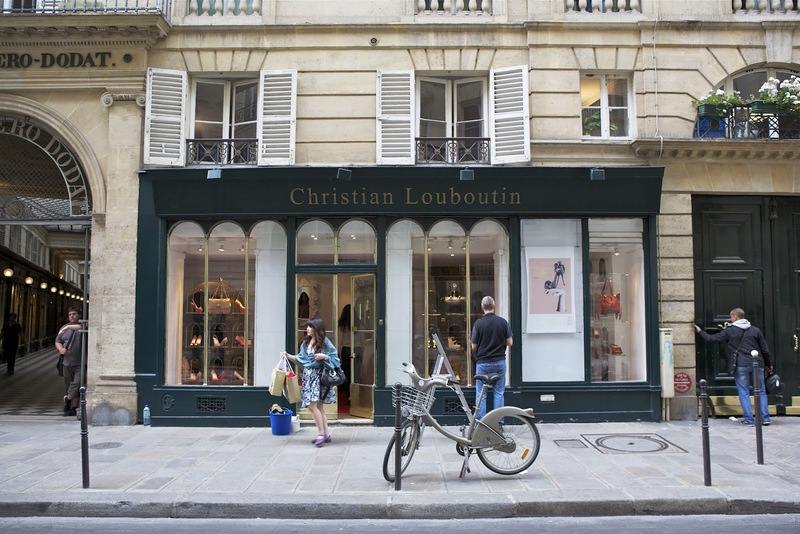 “The dream is a major factor in my language of design,” said Louboutin. This whimsical quality is paramount to his creations, which have been embraced by women all over the world. “Bibbidi-Bobbidi-Boo.” Those magical words helped transform Cinderella from household servant into the belle of the ball. For over fifty years, countless people have enjoyed Disney’s timeless tale where the characters, animation, and music work together to tell the story of a young girl’s dreams coming true. 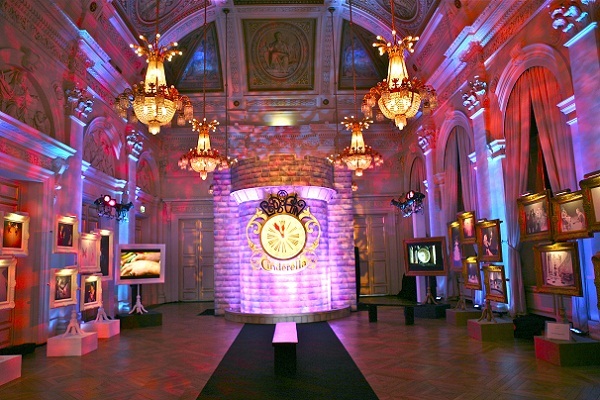 Though “Cinderella” is the fairy tale of a young girl, it is also the fairy tale of the Walt Disney Studios. When “Cinderella” was first released in 1950, the studio was in need of a hit. Many of the films from the late 1940s, such as “Melody Time,” “The Adventures of Ichabod and Mr. Toad,” and “So Dear to My Heart,” had disappointing results. 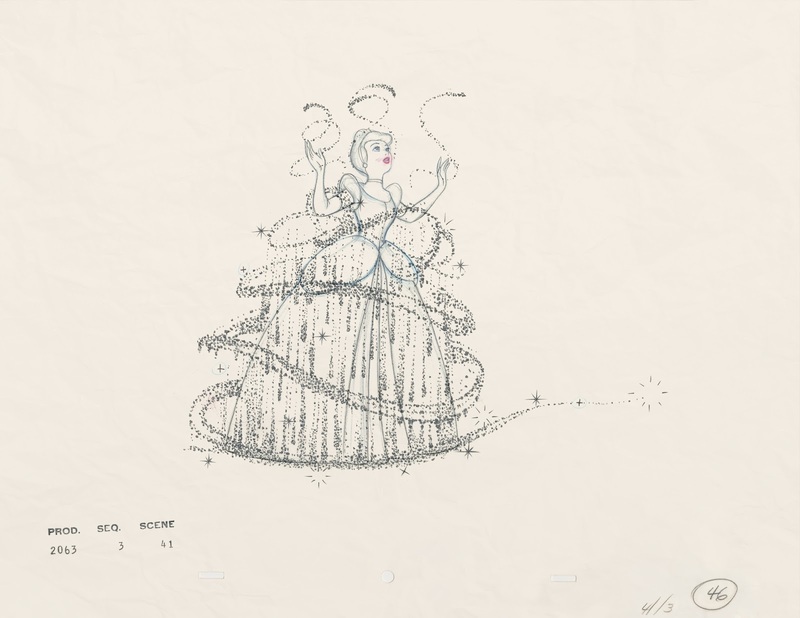 Walt poured many resources into making “Cinderella” as part of a strategy to return the studio to what it was renowned for – feature- length animated films. If “Cinderella” was not a success, then the studios would be forced to shut down. However, Walt had carefully planned just how “Cinderella” would be made as it was a story that had engaged Walt for some time. Walt first tackled the Cinderella story in 1922 for his Kansas City animation studio called Laugh- O-Grams. For its time, the rudimentary animation was considered very sophisticated. More than ten years later, in 1933, Walt again revisited Cinderella with a more polished style of animation. The plan was to produce Cinderella as one of the Silly Symphony series. He sent a story treatment around the studio, along with a request to all his artists for submissions for visual gags for the film. When it was apparent that Cinderella would not work as a Silly Symphony, the idea was shelved. However, the essence of that Silly Symphony can still be seen as some of the earliest gags found their way into the final film. The feature-length animated “Cinderella” that people know and love today was first shot in live-action in order to establish how the characters would move and act. Animators objected to this method, feeling it detracted from their ability to create characters. In retrospect, the animators would understand the necessity for this approach and would acknowledge that Walt had handled things with considerable subtlety. “Cinderella” was a film in which Walt invested heavily, both professionally and personally. He put his best animators and writers to work on the film, and attended every story meeting, adding his insight to every aspect of production. It took Walt almost thirty years to bring this beloved fairy tale to the screen, and his patience and effort were greatly rewarded. “Cinderella” received three Oscar? nominations in 1951, and was one of the highest grossing films of 1950 with more than $4 million at the box office. 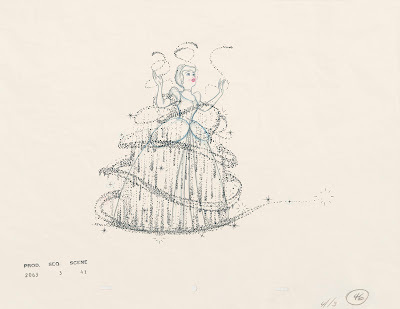 Cinderella’s fairy godmother turned her into a princess for the ball, while Walt Disney was the studio’s fairy godfather and turned the studio back into the thriving entity it had been in its earlier days. While “Cinderella” is a timeless story, Walt Disney and his team of animators and writers were able to make it uniquely their own, and created a classic animated film for the ages. Disney's "Cinderella” will release to Diamond Edition on Blu-ray™ this Fall.